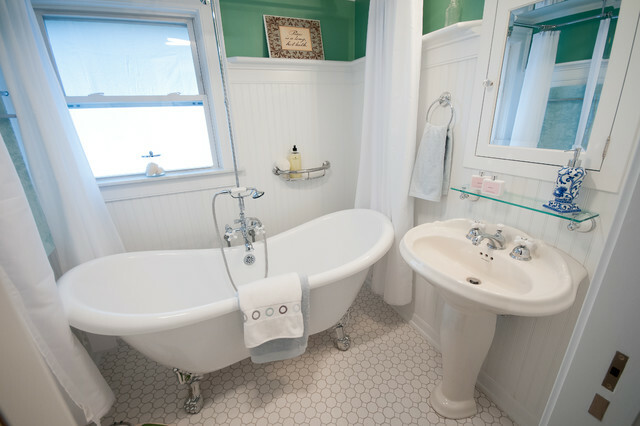 Complete Bath Remodel Designed by Interior Designer Nathan J. Reynolds and Installed by RI Kitchen & Bath. Photography Courtesy of © 2012 John Anderson Photography. floor material? - Hi, Just wondering if the floor is tile, and if so exactly what kind is it? THanks! Water. All over the walls? - Hi, what kind of shower curtain/arrangement do you have to keep from getting the walls and floor wet when someone used the shower handle. We have one like this and guests are never as careful as we are.... Water everywhere. It's such a problem we are planning to redo with a conventional set up. Any advice? You would think that a lot of water would get all over the floor with the way that this bathtub is designed. I think that it looks really awesome though. It has always been my dream to have a tub like that in my bathroom. Maybe we'll consider this next time we remodel.